We all love finely made tools. Dad's old socket set. A nice crescent wrench pilfered from the tool kit of a long-forgotten motorcycle. These are not those tools. 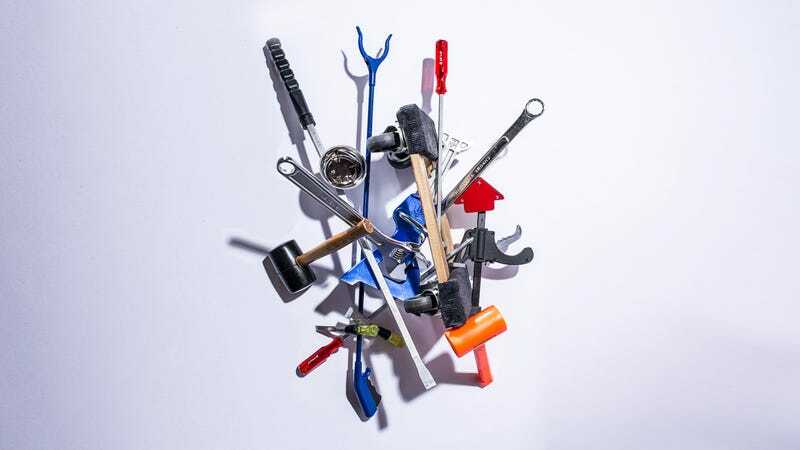 These are the knock-around and throwaway kinda tools you need to have close at hand when you just want a project finished, and you might not have known it, but you need em. Take your pick, a rubber mallet for beating things into submission, or a single-piece dead blow for making sure they stay that way. Pick one up at your local tool barn for about $4 or $10 respectively. 99.9% of the time, you will not need one of these. When that .1% rears its ugly head, plan on spending around 9 bucks. Drop things? This is for the times when your lucky bounces are longer than your arms. Find a little extra reach for about $2. When the mess you've made overwhelms the want to see your tools again, you're probably already using one of these. At around $3, it's worth having a cheapie you can toss out with the fiberglass and resin you've attached it to. Do you like your giant screwdrivers to stay screwdriver shaped? With a proper pry bar you can move whatever you want our of your way for around $19. If you've got a big project in the works you'll probably want a dolly handy. If you've got more than one big project in the works you'll need a flotilla. At about $12, that fleet comes cheap. See more of our cheap tool selections at Road & Track. Greg Hancock is a goddamned hero. Chris Cantle is not.